My coworkers and I have been giving a lot of presentations lately, for a variety of reasons: explaining OpenSesame to buyers and sellers, sharing tips and information about the keys to successful elearning development and promoting OpenSesame. We’ve developed some rules of thumb for captivating presentation audiences and focusing on the key information. If you cover the main points of your presentation effectively, you will leave your audience energetic for discussion and questions. No handouts. Save trees and do your best to make sure people are listening to you by skipping the handouts. What’s your hashtag? While probably not useful for an internal, small group presentation, if you are giving a presentation to a conference crowd, provide a Twitter hashtag to facilitate discussion during your presentation and also continued discussion after your talk is over. Use the tweets to guide discussion. Provide interactive opportunities. Take polls, ask questions and give your audience an opportunity to influence the focus of your discussion. Move quickly. Don’t dwell on any one point. If there’s something your audience wants to revisit, they can bring it up in the discussion and question session. Ten words or less. Make sure your slides have no more than one sentence’s worth of words. Words on your slide should be used to suggest, demonstrate or emphasize your point, not to reiterate the words coming out of your mouth. Use your Flash skills for good, not evil! If you are using animations, use them to reinforce or demonstrate a point you are making, not merely to add transitions between slides. Provide a venue for continued conversation. Whether it’s ongoing discussion around your hashtag, a plan for reconvening the group or making yourself available to answer specific questions, make sure that there’s some opportunity for your listeners to engage with your content in future. Use images. Beautiful, well-chosen images add tremendous value to your presentation by illustrating your point and providing a memorable image for your listeners to connect to. Find Creative Commons-licensed photos on Flickr or Google Image Search. Branch out. In addition to the classic presentation tools like PowerPoint and Keynote, try using Prezi to illustrate complicated concepts, or include video clips in your presentations for a fun change of pace and an opportunity to introduce a new idea in a new way. Listen to Guy Kawasaki. This marketing and communications guru has great ideas about communicating enchantingly. The key with any presentation is to focus on connecting with your audience. Make eye contact, speak clearly and read the crowd’s body language. If they’re getting fidgety, move on to your next point or ask them a question. So what did I overlook? 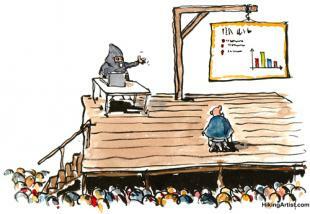 What are your key tips for giving an effective presentation?